With the ASP8024 in production for nearly 20 years, and thousands of consoles in use around the world based on his legendary circuit blocks, we've returned to designer David Dearden’s roots to release the definitive version of the ASP8024 - the Heritage Edition. 20 years ago David set out to design an analogue recording console not knowing it was destined to become a modern classic. To commemorate Audient and his phenomenal achievement we have reimagined his classic design with all new enhancements and features. We are the only company that use the same Class-A mic pre design throughout our entire product range, whether you’re in the studio with the ASP8024-HE or on the road with iD14, you’re always guaranteed the same world class Audient sound. By utilising an american style output amplifier, classic through hole components and a British output transformer we bring you RETRO IRON, a variable output mix bus with LOW BUMP and HIGH LIFT EQ. Based upon two consoles from David’s first job in 1967 at the now legendary Advision Studios in London, RETRO IRON adds punch and 'vibe’ to the consoles mix output. So whether your simply tracking, summing a few inputs or crafting a fully blown console mix RETRO IRON offers you that unique analogue console sound with a little bit of extra character that will put the final touch on any mix. Based on technology from the 80s and 90s the ASP8024’s mix bus compressor is known for adding a rock and roll dynamic to your mix. Often likened to classic analogue boards, the ASP8024’s mix bus compressor provides that classic VCA ‘glue’ that will give your mix that ‘sounds like a record’ feeling. With improved circuitry and a slick new gain reduction VU meter for improved visual feedback (if you've used the ‘gentle needle bounce glue trick’ before, you'll know exactly what we mean) it will fast become one of the most useful tools in your arsenal! At Audient we understand buying a console can be an investment for life and that every feature needs to be exactly right for you and your studio. That’s why we made the ASP8024 one of the only modular consoles on the market - to best fit your requirements! Need a patchbay or DAW control or somewhere to simply put your screen? No problem! We have additional modules such as the Patchbay, Dual Layer Control and Producers Desk that can be added to fit your requested configuration and requirements. 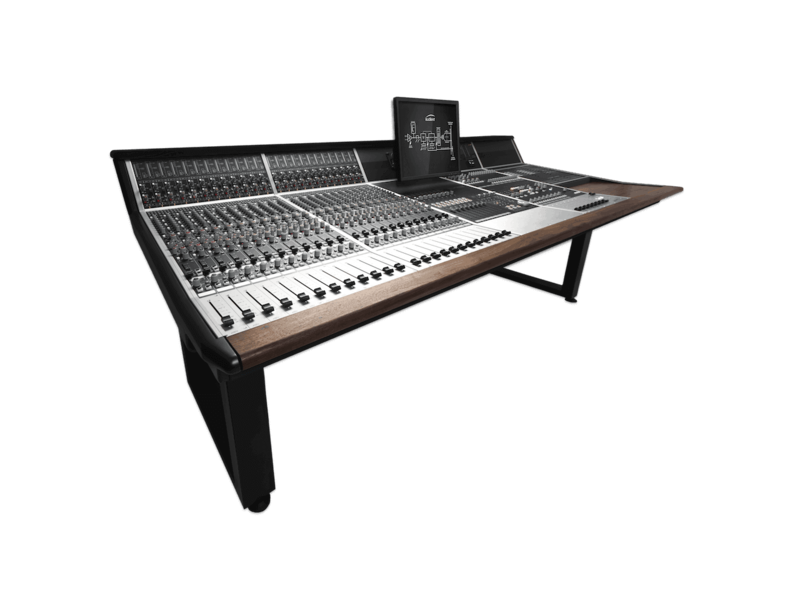 With an impressive array of connectivity options the ASP8024-HE will quickly become the hub of your studio. Whether you're bringing in your DAW outputs, effects returns, monitoring devices and other line sources, or simply connecting to your 2" tape machine the Heritage Edition provides ultimate flexibility for the modern recording studio. Take control of your DAW session with our Dual Layer Control module. DLC provides creative DAW control and automation along with eight moving faders that can be banked across your entire session. DLC also enables you to have 8 channels of VCA automation for adding movement and finesse during your console mix balances and more. A range of useful control features are also available at your fingertips including transport control, track record enable and plug-in selection/editing, all of which enable you to navigate your session with ease. Supports Pro Tools, Logic, Cubase & Nuendo. The consoles inline architecture allows you to start building your mix as your tracking. By using the long and short faders you can create separate record and monitor balances on one channel strip, all while being able access the consoles splitable EQ and aux sends, perfect for getting it right from the start. Experience the classic large format console workflow and take your mixes to the next level. Our fully featured monitor control section offers full artist communication, new remote talkback control, a new additional engineer headphone output, powerful source selection and loud speaker control with a short passive signal path for incredibly clear and accurate monitoring. We know you’ll be reaching for the monitor control knob a lot so we added the phenomenal feeling Alps ‘BLUE VELVET’ pot and custom aluminium knob for a touch of class during everyday use. By looking to the future we are often inspired by the past and when designing the new look and feel of the Heritage edition we wanted to combine the new with the old. Building on the modern classic as well as taking inspiration from classic pieces of gear, our all new ‘Black Raven’ colourway, vintage knobs, chunky fader caps and British design theme not only make the ASP8024-HE a visually stunning centre piece but also make it more intuitive than ever. The ASP8120 Ultra Power Supply is not only incredibly efficient but it’s also whisper quiet, enabling it to be situated in the control room without disturbing your workflow - no need for an expensive and air conditioned machine room! With a low noise transformer and low RPM fan cooling system our power supply is a safe choice for years to come and has helped make the ASP8024-HE more reliable than ever.